Successful investment strategies in 2014 may entail taking well-considered risk. This strategy helps long-term investors buy into broader market performance at a discount. Last year, investors modeling the performance of the S&P 500 index enjoyed sizable returns with little volatility. 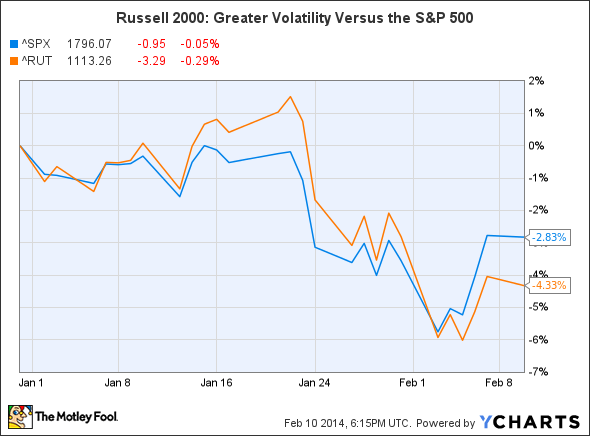 So far in 2014, the S&P trails its prior-year performance by about 4.5%, and volatility has increased in the markets. Should you stick with the relative safety of blue-chip stocks? If you're working out your 2014 investment strategies and can accept a moderate amount of risk, consider bolstering your long-term returns through an index that loosely tracks the S&P 500's movement but in recent years has tended to outperform: the Russell 2000 Index. 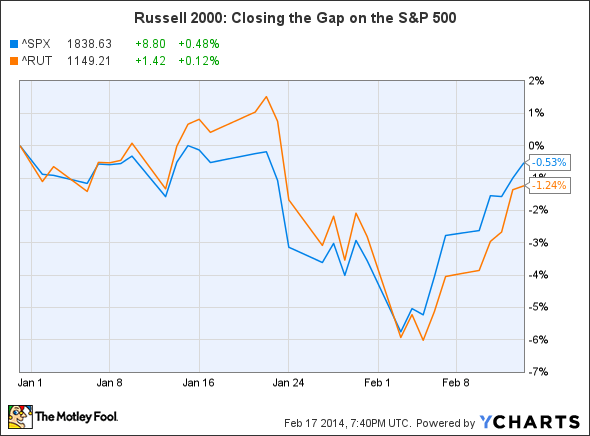 The Russell 2000 Index is a subset of the Russell 3000 Index. Each year, Russell Investments ranks the 3,000 largest U.S. common stocks by market capitalization; these stocks form the Russell 3000. The largest 1,000 stocks in this set are isolated to create the Russell 1000 Index. The next 2,000 comprise the Russell 2000. Since the largest stocks make up the greatest part of U.S. equity markets capitalization, the Russell 2000 teems almost exclusively with small-cap companies. 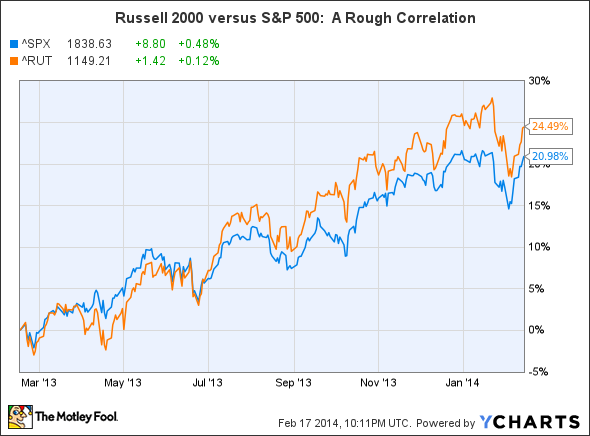 Because of this small-cap composition, the Russell 2000 tends to exhibit greater volatility than the S&P 500. We can see this if we look at two proxies for these indices. The S&P 500 SPDR ETF (NYSEMKT:SPY) sports a beta of 1. Beta is a measure of volatility, and the S&P 500 SPDR ETF is assigned that beta number because it mimics an index that, for all practical purposes, represents the overall market. All other stocks and exchange-traded funds are measured against this baseline number. A stock with a beta of 0.5 can be said to be about half as volatile as the overall market. A stock with a beta of 2 can be thought of as exhibiting about twice as much volatility (and theoretically, twice as much potential for return) as the overall market. 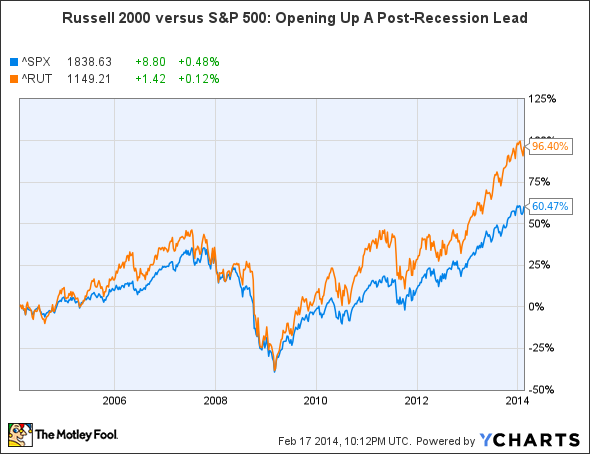 This is not to imply that the Russell 2000 has always outperformed the S&P 500. In fact, in the late 1990s to early 2000s, the S&P 500 consistently posted better performance numbers than the Russell 2000. And we may be headed into a brief period of Russell 2000 weakness. According to Goldman Sachs portfolio strategists, aggregate earnings-per-share growth for the Russell 2000 is projected to hit 23% in 2014, versus just 8% for the S&P 500. However, Goldman analysts and others have also noted that price-to-earnings multiples for Russell 2000 stocks are fairly steep at the moment, relative to both their historical averages and S&P 500 trading multiples. This sets up a potentially advantageous medium to long-term trade. An investor who sets funds aside to average into the market in 2014 can buy the iShares Russell 2000 ETF as a proxy for the Russell 2000. Buying the iShares Russell 2000 ETF when the overall market is weak essentially will allow an investor to purchase it at a discount to the market, due to its higher volatility relative to the S&P 500 SPDR ETF, and also the current valuation vulnerability of the Russell 2000. When the market retracts, the iShares Russell 2000 ETF will theoretically suffer losses that are a third larger than the S&P 500 SPDR ETF. As markets stabilize, and as they rise over the long term, the iShares Russell 2000 ETF will catch up, and the flip side of its greater volatility should manifest itself in upside gain. While there are no guarantees that the Russell 2000 will track ahead of the S&P 500 over the next few years, small-cap stocks have traditionally exhibited higher earnings growth potential than their bulkier cousins. This edge seems set to continue, especially as many large-cap companies have employed conservative fiscal policies recently, returning significant amounts of cash to shareholders in lieu of investing in growth. According to FactSet Research Systems, as of the third quarter of 2013, the trailing 12-month total of S&P 500 company share repurchases stood at $448.1 billion, which was the highest level of share buybacks since the financial crisis -- you have to go all the way back to the second quarter of 2008 to find a higher trailing 12-month total. Small-cap companies, by contrast, tend to reinvest excess cash flow into their operations, rather than return the cash to shareholders via hefty dividends and share buybacks. For growth-oriented stock investors, this in itself provides an all-weather rationale to buy shares in smaller companies. However, should the market continue to fluctuate for the rest of 2014 as it has in the first few weeks, opportunistic investors of all stripes should be able to find entry points for a quite decent long-term trade using the iShares Russell 2000 ETF.